In the last twenty years there has been an explosion of scholarly interest in the Military Orders. With a history stretching from the early twelfth century to the present day, they were among the richest and most powerful orders of the church in medieval Europe. They founded their own states in Prussia and on the Mediterranean islands of Rhodes and Malta. They are of concern to historians of the Church, art and architecture, government, agriculture, estate management, banking, medicine and warfare, and of the expansion of Europe overseas. The conferences on their history, which have been organized in London every four years, have attracted leading scholars from all over the world. The present volume records the proceedings of the Third Conference in 2000 and is essential reading for those interested in the progress of research on these extraordinary institutions. Of the thirty papers published in this collection, two deal with the orders in general, while eighteen concentrate on the Hospital of St John, six on the Temple, and three on the Teutonic Order, together with another on the Order of the Sword Brothers which it absorbed. The preponderance of works on the Hospitallers is perhaps a particular characteristic of this volume, but the fact that most of the papers relate to provincial life, rather than to the headquarters in the east, Prussia, or Malta, accurately reflects modern concerns, as do the contributions on historiography, the papacy, cultural history, and religious life. Examples of new research interests are the paper on bioarchaeology and the two on liturgy. Contents: Introduction, Jonathan Riley-Smith; Part I Historiography: Hospitaller historiography: heritages and heresies, Anthony T. Luttrell; A survey of research on the history of the military ordersIn Poland in the Middle Ages, Maria Starnawska; Historiography and history: medieval studies on the military orders in Spain since 1975, Luis Garcia-Guijarro Ramos; The Knights Templar between theatre and history: Raynouard's works on the Templars (1805–1813), Alain Demurger. Part II Liturgy and Fiction, Heraldry and Piety: Sad stories of the death of kings: last illnesses and funerary rites of the Grand Masters of the Order of St John from Aubusson to the Cotoners, Ann Williams; The liturgical policies of the Hospitallers between the invention of printing and the Council of Trent: the evidence of early printed breviaries and missals, Cristina Dondi; Hospitallers, mysticism, and reform in late medieval Strasburg, Karl Borchardt; Heraldry in medieval Rhodes: Hospitallers and others, Anna-Maria Kasdagli; The fictional Hospitaller. Images and stories of the Knights of Malta in Count Jan Potocki's Manuscript Found in Sargossa, Yuri Stoyanov. Part III Templars, Teutonic Knights, and other Military Orders: The Templar order in north-western Italy: a general picture (1142–1312), Elena Bellomo; The Templar James of Garrigans: illuminator and deserter, Alan Forey; The university of Paris and the trial of the Templars, Paul F. Crawford; A look through the keyhole: Templars in Italy from the trial testimony, Ann Gilmour-Bryson; Teutonic castles in Cilician Armenia: a reappraisal, Kristian Molin; The use of indulgences by the Teutonic Order in the Middle Ages, Axel Ehlers; Innocent III and the origins of the Order of Sword Brothers, Barbara Bombi; The military orders and Papal crusading propaganda, Rudolf Hiestand; The Hospitaller and Templar houses of Périgord: some observations, David Bryson; The battle of Tannenberg-Grunwald-Zalgiris (1410) as reflected in 20th-century monuments, Sven Ekdahl. Part IV Hospitallers: The decree of 1262: a glimpse into the economic decision-making of the Hospitallers, Judith Bronstein; The Hospitaller order in Acre and Manueth: the ceramic evidence, Edna J. Stern; Bioarchaeological analysis of the latrine soil from the 13th-century Hospital of St John in Acre, Israel, Piers D. Mitchell, Jacqui P. Huntley, Eliezer Stern; The Hospitallers and the 'Peasants' Revolt' of 1381, revisited, Helen Nicholson; The Hospitallers and the Kings of Castile in the 14th and 15th centuries, Carlos Barquero Goñi; The visit of Emperor Manuel II Palaeogogus at the Priory of St John in 1401, John Chrysostomides; John Kaye, the 'dread Turk', and the siege of Rhodes, Theresa M. Vann; The Hospitaller fraternity of St John at SS Johan and Cordula in Cologne, Klaus Militzer; Hospitaller commanderies in the Kingdom of Hungary (c. 1150–c. 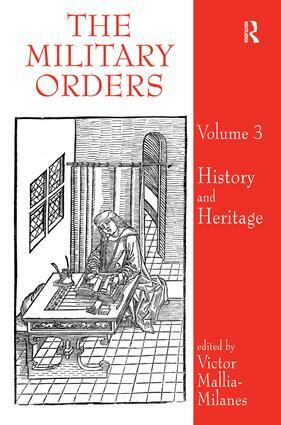 1330), Zsolt Hunyadi; Frisians and foreigners in the Hospitaller house of Sneek: origin and careers, Johannes Adriaan Mol; Hospitaller baroque culture: the Order of St John's legacy to early modern Malta, Victor Mallia-Milanes; Select bibliography; Index. Victor Mallia-Milanes is Professor in the Department of History at the University of Malta.